Angler's Mail editor Tim Knight (pictured below) looks at starting fishing and improving your fishing. Cast your mind back to how you started fishing – what or who drew you into it? And what or who made you the better angler you are now? Never mind catching – it took me several attempts to catch my first fish! I was six though, and the chance of any Thames fish (it was a tough river then) taking a bit of bread dangled in the edge on a big hook to thick line was… highly unlikely. Therein lies one key point; who took you fishing – my family were all non-anglers – makes such a difference. For me in the mid 1970s, commercial pools had not been created, fishing wasn’t on TV, and there was no internet stuffed with ‘how tos’ and videos. Even today, having someone to show you the basics is a huge shortcut. Carp star Julian Cundiff has helped many aspiring anglers along their way with his selfless approach. A true gent! I recall a brilliant feature by Angler’s Mail magazine regular columnist Colin Davidson, interviewing Julian Cundiff, a carp angler who has been on the seen throughout its massive modern growth. It shines through how this is a guy generous in helping others throughout his own angling life. Just a few seconds of his time, Julian points out, can make a big difference to someone. Little things he did helped Colin on his way. And Col also learned via the Mail’s original Carp World with Andy Little – a part of the mag that Col has been part of for many years, sharing his own brilliant insight. I’ve recalled what got me hooked – and what I suspect may ring bells with your own angling development. I think that Denton Zoomer ended up in a far bank tree… it cast a bit too well! The glorious gift of gear! I bet presents helped your angling development. For me, it all started with a bamboo cane with some crude line, what could just about be called a float and a hook. nd my mum’s boss buying me a Denton Zoomer float when he heard I couldn’t cast far! These gifts and more helped me along. It’s amazing what the sniff of success does to a youngster’s confidence. I still store my hooks in a leather reel case I won from another fishing publication when I was at junior school. At that time, the prize not only gave me unexpected youthful pride, it made me feel part of something bigger. Like a generation of anglers, I learned a lot and have fond memories of the old Go Fishing series. 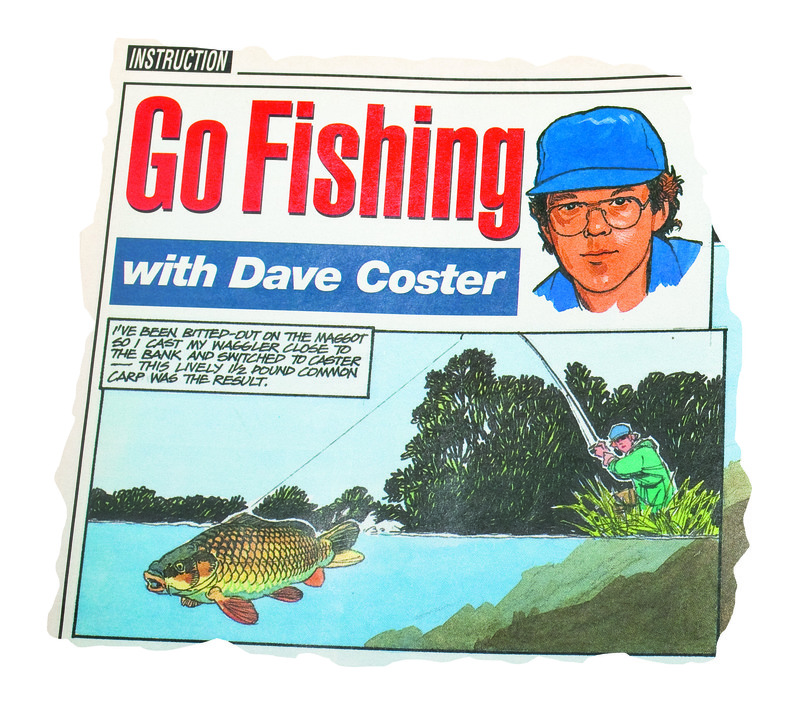 Dave Coster appears exclusively in Angler’s Mail magazine today with his insightful Do It Like Dave column. For me and thousands of Mail readers it was hand-me-down fishing print publications which opened up a window on the world. Buying the Mail and other mags myself as a teenager, I learned through Go Fishing cartoon strips with Dave Coster, Andy Little’s Carp World, and the old Helpline (now All The Answers). The people you meet in life help make you who you are, and in angling snippets of info get filed away. So much of my early development was via insight gleaned off friends. Then it was from fishing club buddies, chance encounters on the bank, and – most of all – in a tackle shop where I helped out. Yes you can learn lots via today’s media, but hearing it off people face-to-face, locally, can often feel more essential. Maybe this should be No.1, and my list is in no special order. Could I have such great fishing memories without the lifts in the car off my dad? The days before I could swim when the old man (non-angler) would sit there with me! The buying me (some) of the gear I so wanted at Christmas or birthday? Yes this too, was part of getting me into fishing and keeping me hooked. It’s not just a hobby… it’s a way of life! HOW did you first get into fishing? Share your comments with Angler’s Mail magazine on Facebook this week. Or email amletters@timeinc.com about this or anything angling-related. Your comments could be published in the print magazine.